Exporter of a wide range of products which include goddess laxmi white marble colored statue. The stunning idol of Goddess Laxmi White Marble Colored Statue that our master craftsmen sculpt from high quality marble is a rare piece of artistry where white marble juxtapose with play of muted color make the Laxmi statue stand out in artistic finesse. Made from pristine white marble source from certified vendors this idol looks richer with passage of time. We offer the range in most don to earth prices. 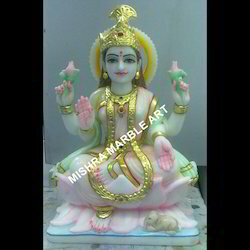 Looking for Laxmi White Marble Statue ?